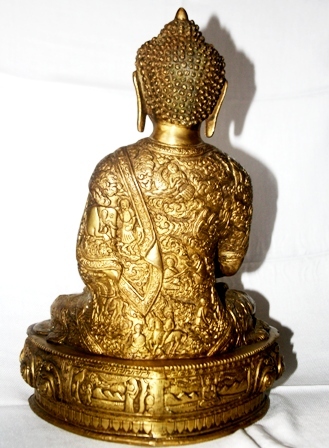 MEDICINE BUDDHA, BRASS STATUE WITH BEAUTIFUL EMBROIDERED SHAWL ON 14 INCHES BUDDHA IDOL. 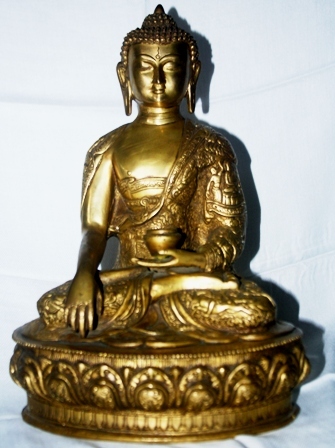 BUY THIS HEALING BUDDHA IDOL FROM OUR ONLINE SHOP, DHARAMSALA. Product no. BS001 is a finely carved, hand made Buddha Statue with a delicate brass embroidered shawl. The Statue is of the Medicine Buddha, the Supreme Healer (or Sangye Menla in Tibetan). He holds the Vase of Healing in his hand which symbolizes the nourishment of the soul. The artist of our online shop in Dharamsala, Buddha Bazaar has exquisitely captured the radiant beauty of the Medicine Buddha. The brass statue is gold polished and embellished with an intricately carved monastic shawl. Enjoy this 14 inches Buddha Statue as an exclusive Buy Now offer. Height: 14 inches, Length: 10 inches. Price (inclusive of Buddha statue and Mantra Scroll): INR 25,900. Like the information on our Medicine Buddha with Shawl figurine, visit us here for more information on Buddhism.